Whenever there is an emergency vehicle on an emergency run, there are special rules that apply to those type of vehicles. Often, even in congested traffic, one is confronted with emergency vehicles on an emergency run. For example, police vehicle who are in pursuit of a criminal, become involved in high speed chases. Perhaps a police vehicle is attempting to get to a crime scene in progress, they then become an emergency vehicle on an emergency run. Regardless, if they want the privileges of an emergency vehicle on an emergency run, they must engage their siren and flashing lights. Failure to do so renders them liable for their negligence. Moreover, the police vehicles are not given unfettered rights to do what they please when they have their light flashing and their siren blasting. If they come to an intersection controlled by a traffic light, they still must operate their vehicle with some degree of care and make sure it is safe to proceed. They cannot just blindly run through an intersection as if no other vehicles have any rights. They must slow down when they approach a red light to assure traffic has slowed or stopped form them. They do have the right of way, but not without restriction. If they do not have their lights flashing and their siren blasting, they simply are not considered an emergency vehicle on an emergency run. 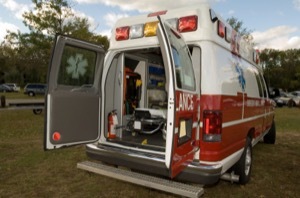 An ambulance is also treated as an emergency vehicle on an emergency run if they also have their lights flashing and siren blasting. An ambulance cannot simply proceed without caution, especially without lights and sirens operating. There is case law that defines what is meant by an emergency vehicle on an emergency run. There is no protection for the individual driver if they ignore the rules and regulations of the road with regard to emergency vehicles. Indeed, the regulations do suggest that the driver of an alleged emergency vehicle on an emergency run should stop at a red light before proceeding in order to make sure it is safe to proceed. Even if an emergency vehicle on an emergency run is approaching an intersection not controlled by a red light or stop sign, there is still a duty to slow down at the intersection to assure there is no safety hazard by proceeding. Clearly it is in the public’s best interest to permit police vehicles and ambulances to arrive at accident scenes, or crime scenes as quickly as possible. However, it is also in the public’s best interest to make sure they do so safely so the public at large is not put in danger. Since these emergency vehicles often travel at exceptionally high speeds, there has to be some control; otherwise they could create as much or more danger that what they are trying to protect against. If you are involved in an accident with an emergency vehicle on an emergency run, please contact our office to discuss your options. There are devices on many of these vehicle that can be investigated to determine just how fast they were travelling.